Your ability to long jump further than you have ever done before depends on the improvement of three easily identifiable elements. I am not saying that these elements will be easily resolved once identified. It will take a lot of hard work and discipline wrapped in a package called a well-planned training program before you will see any appreciative competitive results. By far the most important element for a successful long jump is your speed at the instance of take-off. Research has strongly correlated the speed of the athlete’s centre of mass with the distance of their jump. Further, it has also been established that for every 0.1 meters per second (m/s) in speed improvement, you can expect an increase of about 10cm in jump distance. However, sometimes it is not because jumpers lack good basic speed that runway velocities are poor. Speed improvements in the long jump can come simply from putting together a well structured runway. By that, I mean you put together a run up which brings you to the take-off board with the right rhythm and with the fastest optimum speed. For example, on one attempt you might begin your runway at too high a tempo and by midpoint of the run, you find yourself already at your maximum stride frequency and power. This attempt is more likely to bring you to the take-off point decelerating in speed. On your next attempt you construct your runway more gradually with your speed increasing on every stride. This time you find yourself arriving at the board still accelerating up to your maximum speed. A runway constructed as in our second example is more likely to bring you to the take-off point with a higher take-off speed than the first attempt. This alone can increase the potential for you to jump further. You can find a more in-depth look at the proper construction of a run up here. You can also find examples of ways to improve your maximum speed in this article. Being strong is important for good long jumping and improving your strength will go a long way to achieving that. However, developing the general definition of strength will not support you in your goal to jump further (unless you are new to strength training). For elite long jumping, you are going to need to develop the Meta definitions of strength to acquire the unique ability to propel yourself off the floor quickly. As they are unique ways of developing strength, in the literature they are referred to as “special strength”. These Meta definitions are explosive strength and reactive strength, collectively known as power. Why Do You Need Special Strength To Long Jump Further? Under isometric conditions, muscles normally need 300-500 milliseconds to develop maximum tension. 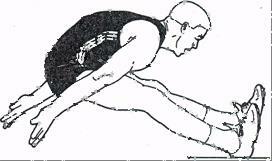 Jumpers typically have 120 milliseconds to apply the forces needed for a good take-off. It is, therefore, impossible for you to exert your maximum force for a long jump take-off. With this lack of time to apply full force at take-off, it is a question of how much force you can exert in the limited time available. It is important, therefore, for you to develop the ability to generate force quickly for good long jumping. The term we use for this ability is the rate of force development (RFD). The RFD values differ from one athlete to the other, but it is a quality that can be trained and improved. You must learn to improve your RFD if you are to long jump further. You can find examples of how to improve your RFD here. Of the four elements above, improving your landing into the sand pit is probably an area where you can make sizable gains quickly. So, let’s take a more in-depth look at how you can achieve this. The whole idea behind horizontal jumps landing mechanics is that as you enter the sand pit, your feet should be as far ahead of your centre of mass (CM) as possible. The current view is that your hips should be fully flexed prior to the touchdown into the sand pit. Your torso should be well forwards over your legs, and your arms extended behind the trunk. As your feet hit the sand, you should begin to straighten your trunk as you flex your knee to absorb the landing and as a consequence your CM will pass over and beyond the initial landing point. Landing in this way is the optimum landing position for all horizontal jumps. Following the approach of improving your speed, your special strengths and making tweaks to your take-off, flight and landing techniques will help you to long jump further. From "Long Jump Further - Guaranteed" Back To "Faster, Stronger, Better – Your Shortcut To Improved Athletic Performance"